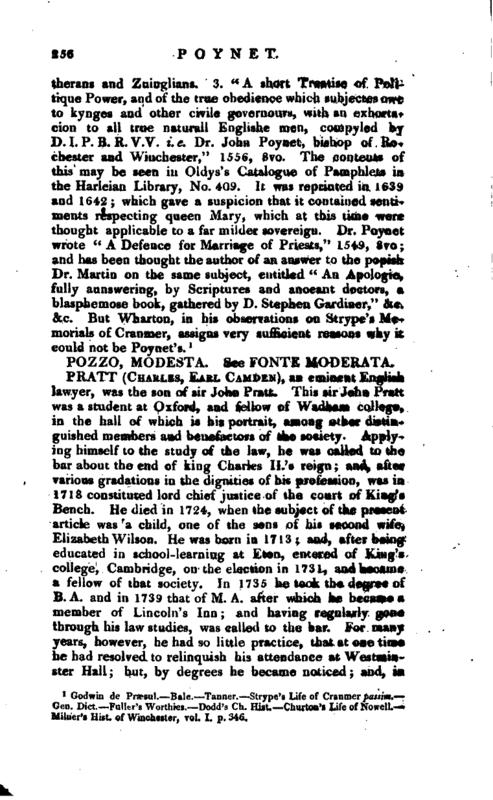 , an eminent English lawyer, was the son of sir John Pratt. This sir John Pratt was a student at Oxford, and fellow of Wadham college, in the hall of which is his portrait, among other distinguished members and benefactors of the society. Applying himself to the study of the law, he was called to the bar about the end of king Charles II.‘s reign and. after various gradations in the dignities of his profession, was in 1718 constituted lord chief justice of the court of King’s Bench. He died in 1724, when the subject of the present article was ’a child, one of the sons of his second wife, Elizabeth Wilson. He was born in 1713 and, after being educated in school-learning at Eton, entered of King’s college, Cambridge, on the election in 1731, and became a fellow of that society. In 1735 he took the degree of B. A. and in 1739 that of M. A. after which he became a member of Lincoln’s Inn; and having regularly gone through his law studies, was called to the bar. For many years, however, he had so little practice, that at one time he had resolved to relinquish his attendance at Westminster Hall; but, by degrees he became noticed; and, in | 1752, we find him supporting the rights of juries, in opposition to Mr. Murray, afterwards lord Mansfield, in a case of libel, the King y. Owen, when his client was acquitted. In 1754 he was chosen representative for the borough of Downton, in Wiltshire and in 1759, recorder of Bath; and the same year was made his majesty’s attorney general. In Dec. 1761, he was constituted chief justice of the court of Common Pleas, and received the honour of knighthood; and in 1762, was called to the degree of serjeant-at-law. His lordship had the reputation of having presided in that court with a dignity, weight, and impartiality, never exceeded by any of his predecessors and when the celebrated John Wilkes was seized and committed to the Tower, upon a general warrant, his lordship granted him an Habeas Corpus; and when Wilkes was brought before the court of Common Pleas, discharged him from his confinement in the Tower, on May 6, 1763, after stating the case, in a speech which did him great honour. His wise and spirited behaviour upon this occasion, and in the consequent judicial proceedings, between the printers of the “North Briton” and others concerned in that publication, or in apprehending the authors, was so acceptable to the nation, that the lord mayor, aldermen, and common-council of the city of London, presented him with the freedom of their corporation in a gold box, an,d desired him to sit for his picture, which was put up in the Guildhall in 1764, with a suitable inscription at the bottom of the frame. 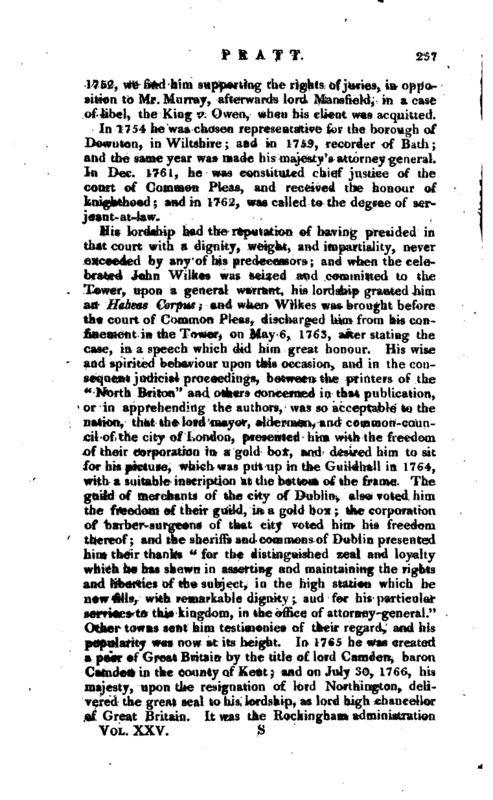 The guild of merchants of the city of Dublin, also voted him the freedom of their guild, in a gold box the corporation of barber- surgeons of that city voted him his freedom thereof; and the sheriffs and commons of Dublin presented him their thanks “for the distinguished zeal and loyalty which he has shewn in asserting and maintaining the rights and liberties of the subject, in the high station whichhe now fills, with remarkable dignity and for his particular services to this kingdom, in the office of attorney-general.” Other towns sent him testimonies of their regard, and his popularity was now at its height. In 1765 he was created a peer of Great Britain by the title of lord Camclen, baron Camden in the county of Kent and on July 30, 1766, his majesty, upon the resignation of lord Northington, delivered the great seal to his lordship, as lord high chancellor of Great Britain. It was the Rockingham administration | who promoted his lordship’s advancement to the peerage; but they did not thereby obtain his entire support in parliament for when the declaratory bill, asserting the right of parliament to make laws, binding the colonies in all cases whatever, was brought into the House of Lords, he opposed it with the greatest vigour. Lord Camden, whatever might be thought of his opinions, was uniformly independent, and incurred a portion of popular odium for supporting the suspension of the law, in order to prevent the exportation of corn at a time when scarcity was impending. On this occasion he happened to make a sarcastic reply to lord Temple, which drew upon him the wrath of Junius; but for this he had as little regard as for the more sober invectives of party. As a lord chancellor, he appears to have conciliated the good opinion of all parties. His acuteness and judgment, and the perspicuity with w’hich he delivered his opinions, and his general politeness, mixed with a becoming regard to the dignity of his office, all produced the highest respect and confidence in his decisions. But as he still adhered to his opinion against the taxation of the Americans, which he strongly and publicly opposed on every occasion, he was removed from his high office in 1770. 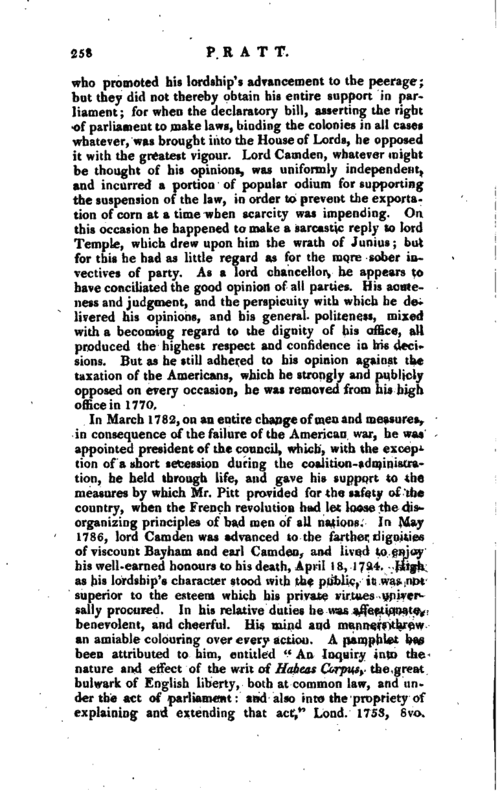 In March 1782, on an entire change of men and measures, in consequence of the failure of the American war, he was appointed president of the council, which, with the exception of a short secession during the coalition-administration, he held through life, and gave his support to the measures by which Mr. Pitt provided for the safety of the country, when the French revolution had let loose the disorganizing principles of bad men of all nations. 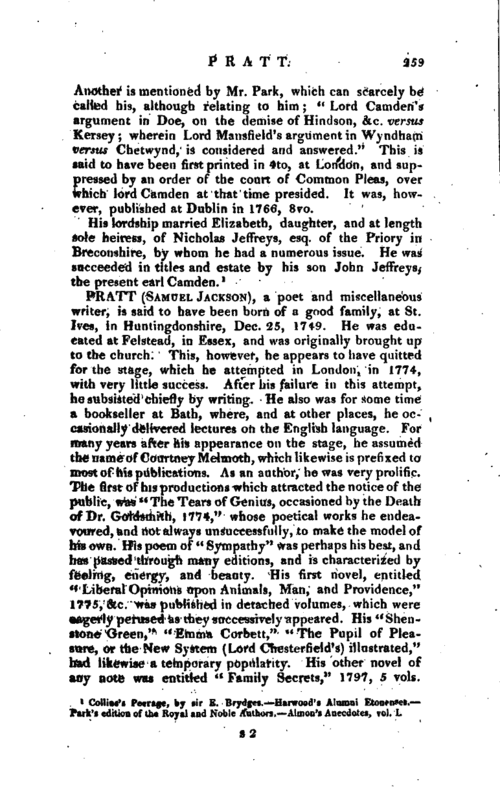 In May 1786, lord Camden was advanced to the farther dignities of viscount Bayham and earl Camden, and lived to enjoy his well-earned honours to his death, April 18, 1794. High as his lordship’s character stood with the public, it was not superior to the esteem which his private virtues universally procured. In his relative duties he was affectionate, benevolent, and cheerful. His mind and manners threw an amiable colouring over every action. A pamphlet has been attributed to him, entitled “An Inquiry into the nature and etfect of the writ of Habeas Corpus, the great bulwark of English liberty, both at common law, and under the act of parliament and also into the propriety of explaining and extending that act,” Lond. 1753, 8vo. | Another is mentioned by Mr. Park, which can scarcely be called his, although relating to him “Lord Camden’s argument in Doe, on the demise of Hindson, &c. versus Kersey; wherein Lord Mansfield’s argument in Wyndham versus Chetwynd, is considered and answered.” This is said to have been first printed in 4to, at London, and suppressed by an order of the court of Common Pleas, over which lord Camden at that time presided. It was, however, published at Dublin in 1766, 8vo. 1 Collins’ s Peerage, by sir E. Brydges. Harwood’s AlumniEtonenses. Park’s edition of the Royal and Noble Authors. Alrnon’s Anecdotes, vol. I.